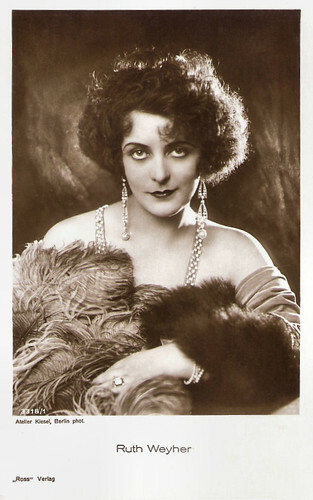 Ruth Weyher (1901-1983) was a beautiful and passionate actress of the German silent cinema. 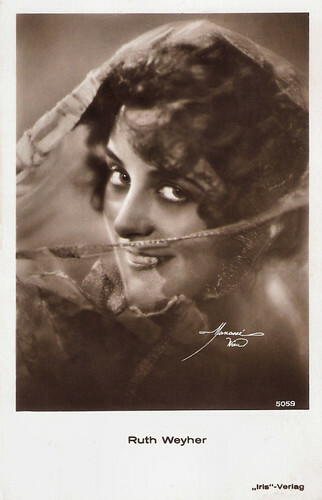 She appeared in 48 films between 1920 and 1930. 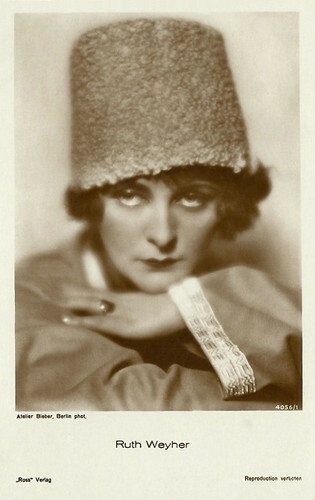 Among her best known films are the expressionist classic Schatten/Warning Shadows (1923) and G.W. Pabst's Freudian Geheimnisse einer Seele/Secrets of a Soul (1926). Austrian postcard by Iris Verlag, no. 5059. Photo: Manassé, Wien. German postcard by Ross Verlag, no. 3089/1, 1928-1929. Photo: Atelier Kiesel, Berlin. German postcard by Ross Verlag, no. 3318/1, 1928-1929. Photo: Atelier Kiesel, Berlin. German postcard by Ross Verlag, Berlin, no. 4032/1, 1929-1930. Photo: Atelier Dührkoop, Berlin. German postcard by Ross Verlag, Berlin, no. 4056/2, 1929-1930. Photo: Atelier Bieber, Berlin. Ruth Ellen Weyher was born in 1901 in Neumark, West Prussia (now Nowinjasta, Poland). She was the daughter of law inspector Paul Ferdinand Weyher and his wife Lätitia Theone Weyher-Schulze. 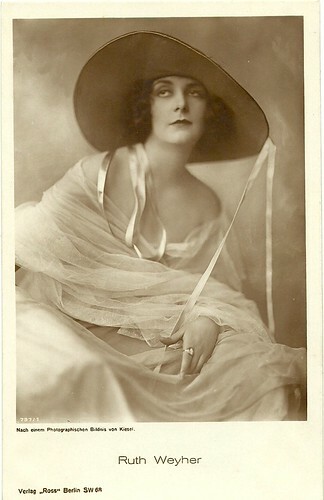 She grew up in Danzig (now Gdansk, Poland), until she moved with her parents and brother to Halle in 1914. She studied painting at the Kunstgewerbeschule in Halle, but she switched to the conservatory to study singing. 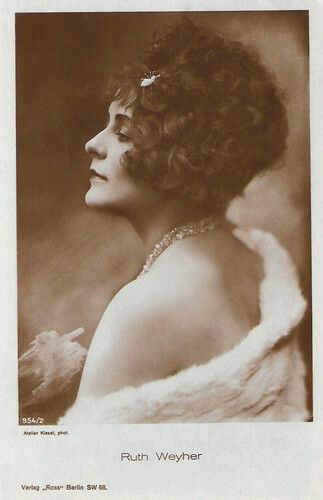 Due to a serious illness she lost her singing voice and in 1919 she went to Berlin where she visited the acting school of the Deutsches Theater and was a pupil of Max Reinhardt. 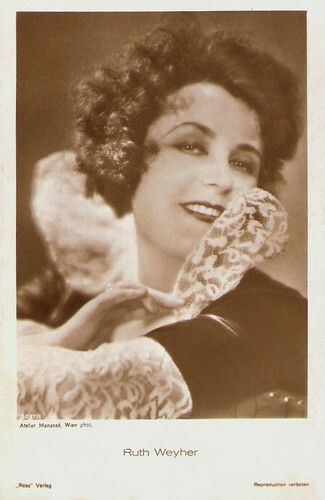 In Munich, Weyher had her debut as a stage actress. 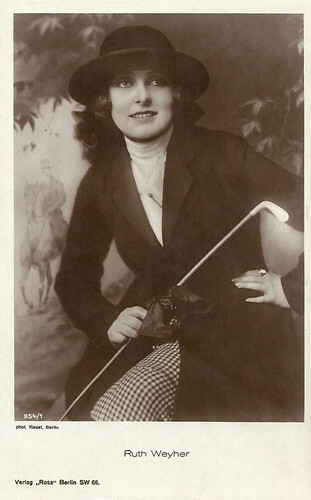 Already in 1919 she got her first film roles. 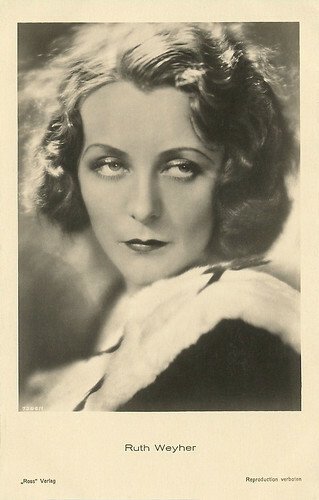 In countless entertainment films she played the adventurous or passionate woman, as in Die Wahrsagerin von Paris/The fortune-teller of Paris (Hans Heinz Hartt, 1920), Sterbende Völker/Dying people (Robert Reinert, 1922) with Aud Egede Nissen, Das alte Gesetz/This Ancient Law (Ewald André Dupont, 1923) starring Henny Porten, and the classic Expressionist film Schatten/Warning Shadows (Arthur Robison, 1923). 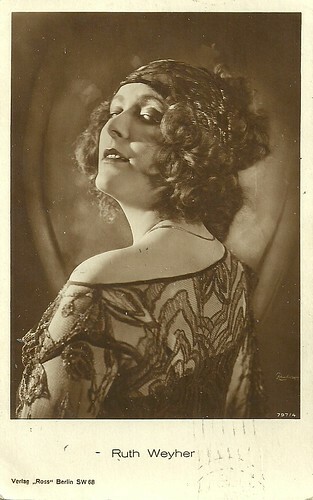 In Schatten, Weyher played the beautiful wife of a jealous count (Fritz Kortner), who suspects her of infidelity. During a banquet, he becomes enraged with his dinner guests when they pretend to kiss his wife's silhouetted shadow. This seemingly innocent romantic indiscretion is met with violent retribution. Liam O'Leary reviews the film at Film Reference: "Perfect films like this were not without their influence. Much of the innovative camera work and visual style has been absorbed into the accepted techniques of the cinema. But there is a special patina which the pioneer film has that can never be transmitted and that is the excitement generated by an original and creative spirit; Schatten is unique in the history of film, and unlike anything its creator, Arthur Robison, ever attempted again." German postcard by Ross Verlag, Berlin, no. 787/4. Photo: Alex Binder. German postcard by Ross Verlag, no. 797/1, 1925-1926. Photo: Kiesel. Collection: Didier Hanson. French postcard by EC, no. 543. Photo: Publicity still for Die Apachen von Paris/Paname...n'est pas Paris/Apaches of Paris (Nikolai Malikoff, 1927) with Jaque Catelain. Collection: Didier Hanson. German postcard by Ross Verlag, no. 954/1, 1925-1926. Photo: Kiesel, Berlin. German postcard by Ross Verlag, Berlin, no. 954/2, 1925-1926. Photo: Atelier Kiesel. 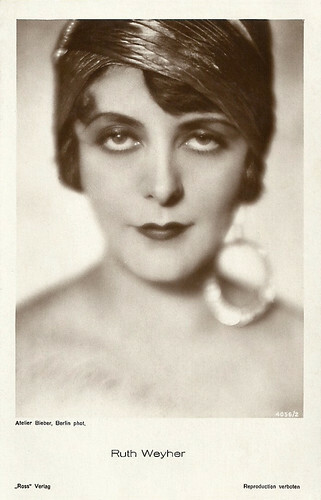 Slowly Ruth Weyher moved to leading parts in films such as the title role in the film operetta Die keusche Susanne/The Girl in the Taxi (Richard Eichberg, 1926) which co-starred Willy Fritsch and Lilian Harvey. The cheeky Susanna leads a wild nightlife in Paris, while she plays the chaste woman with her relatives in the countryside. Other big films of Weyher were Komödie des Herzens/Comedy of the heart (Rochus Gliese, 1924) with Lil Dagover and Nigel Barrie, the William Shakespeare adaptation Ein Sommernachtstraum/A Midsummer Night's Dream (Hans Neuman, 1925), Die Feuertänzerin/The fire dancer (Robert Dinesen, 1925), and Geheimnisse einer Seele/Secrets of a Soul (G.W. Pabst, 1926) – in which she plays the wife of a chemistry professor (Werner Krauss) haunted by his dreams of stabbing his wife's cousin, which he eventually also tries to in real life. James Travers notes at Films de France: "Viewed today, it is much easier to appreciate this film for its artistic merits – its striking visual design and atmospheric expressionistic photography – than its intellectual content. As a serious attempt to represent Freud’s ideas it leaves a great deal to be desired and almost comes across as a mockery of psychoanalytic theory." At AllMovie, Hal Erickson adds: "The dream sequences - to which Pabst gave credence by hiring two of Freud's assistants as consultants - elaborate upon existing Freudian symbolism to the bursting point. Pabst had always been fascinated by the subconscious; here he seems intoxicated by the subject. Especially effective is Pabst's use of multiple dissolves and superimpositions, all accomplished 'in the camera' without any post-production lab work." Other titles of Weyher's films are Die Flammen lügen/The flames lie (Carl Froehlich, 1926), Die Hochstaplerin/The Impostor (Martin Berger, 1926), the Swedish-German coproduction Parisiskor/Dr. Monnier und die Frauen/Doctors' Women (Gustav Molander, 1927) with Fred Louis Lerch, and the Carlo Aldini film Einer gegen Alle/One Against All (Nunzio Malasomma, 1927). 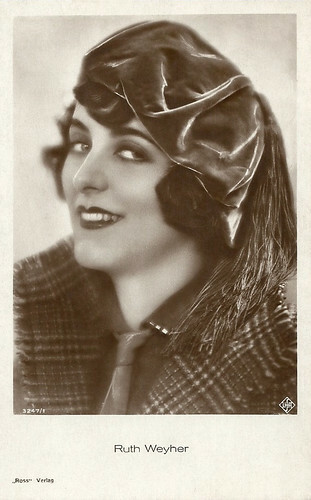 In 1928 Weyher founded her own production company Ruth Weyher-Film GmbH, but after only one film, Was ist los mit Nanette/What's the Matter with Nanette? 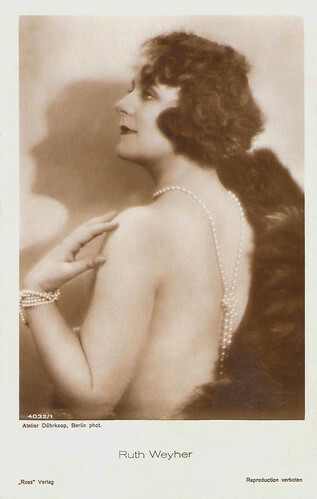 (Holger-Madsen, 1928), with herself in the title role, she quitted producing. 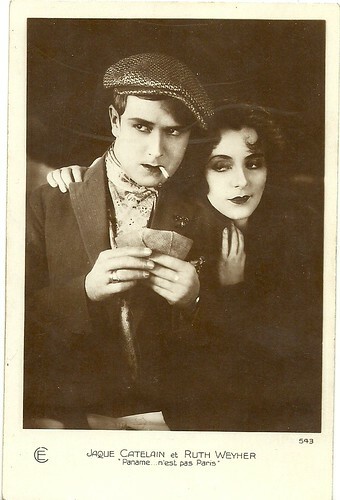 Late silent productions were the Italian film La grazia/The grace (Aldo De Benedetti, 1929) with Weyher as femme fatale opposite Carmen Boni, and the French romantic drama L’appassionata/Appassionata (André Liabel, Léon Mathot, 1929) starring Fernand Fabre and Léon Mathot. 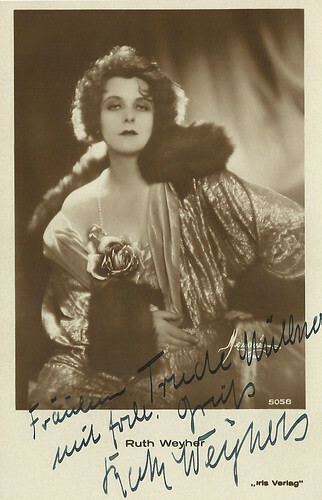 Weyher rarely acted in sound films. One example is the Carlo Aldini production Im Kampf mit der Unterwelt/In the battle with the underworld (1930), which he directed and in which he played the lead as well. In 1932, Ruth Weyher married the Munich based publisher and printing plant owner Hans Geiselberger and according to his wishes she ended her career. She died in Munich in 1983. German postcard by Ross Verlag, no. 3247/1, 1928-1929. Photo: Ufa. German postcard by Ross Verlag, no. 4056/1, 1929-1930. Photo: Atelier Bieber, Berlin. German postcard by Ross Verlag, no. 5037/1, 1930-1931. Photo: Atelier Manassé, Wien (Vienna). Austrian postcard by Iris Verlag, no. 5058. Photo Manassé, Vienna. Collection: Didier Hanson. German postcard by Ross Verlag, no. 7306/1, 1932-1933. Collection: Didier Hanson. Sources: Liam O'Leary (Film Reference), James Travers (Films de France), Thomas Staedeli (Cyranos), Hal Erickson (AllMovie), Dan Pavlides (AllMovie), The Androom Archives, Filmportal.de, Wikipedia (German and English), and IMDb. NB Filmportal.de does not indicate Einer gegen Alle as a film with Weyher while IMDb does. Im Kampf mit der Unterwelt (IMDb) is not mentioned at all by Filmportal.de.